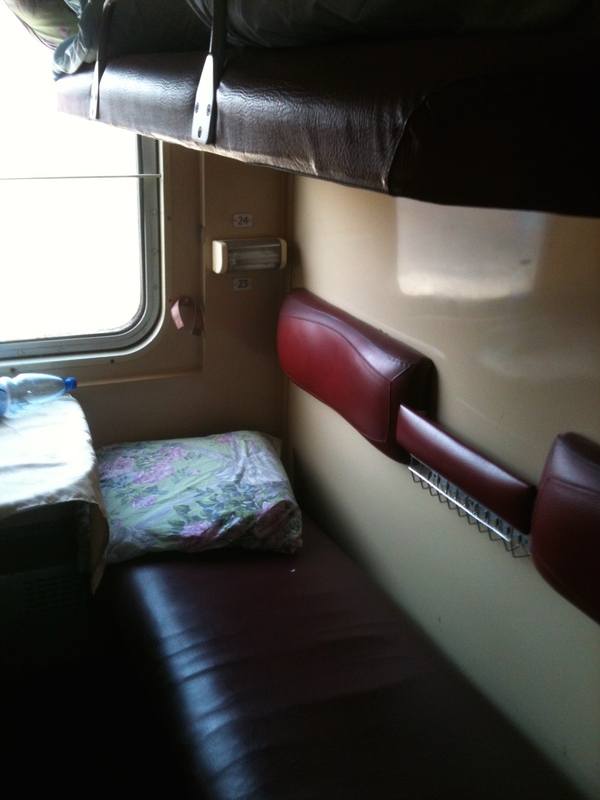 When I decided to take the train to Mariupol from Kyiv, I was apprehensive. I wasn’t really worried about traveling into a war zone, the war in the East had been subsiding for some time. No, I was more worried about the unknown, the not knowing what I didn’t know. The hardest part to begin with was figuring out how to buy the ticket. I searched the internet to no avail as the choices that appear are totally hopeless, spammy sites that scream you’re getting ripped off, are out of date, or don’t provide accurate information. Finally, a friend gave me this Ukraine Train Travel Site, and bingo I was in business. It’s easy to use and functional, although it helps to speak a little Ukrainian. I was advised to buy the ‘coupe’ ticket for about $15.. It’s a berth with 4 beds. On hindsight, I should have splurged the extra $20 to buy the first class cabin, only 2 beds; I’ll get into that later. On the way back, I actually bought the ticket at the cashier (Kacca) at the train station. That was painless as well, just bring your passport and enough cash and leave some time to stand in line. Just so you know, there is a VIP waiting room upstairs at Kyiv-Pasazhyrs’kyi station. It only costs a few Hryvnia and it’s well worth the money, free WIFI is also available there. There is no wifi on the train. 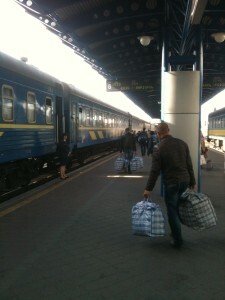 Upon finding your track and heading to the train, there are stern Ukrainian women guarding each wagon. Show them your ticket and they will let you board. The trick is to find your berth. There are numbers on the outside of the cabin entrance which correspond to your ticket. The odd bunks are on the bottom bed. The even are on the top. I would most definitely try for the bottom bed when buying your ticket. It’s much more comfortable and easy to get around. Upon arrival at your space for the next 20 hours, there will most likely be people waiting for you in the cabin. The passengers I traveled with were all very friendly and hospitable. They were more than willing to help me understand what was going on and to take care of me if I needed help translating or whatever. There were the two old ladies who cackled with laughter in the hallway all night (there are fold down seats outside your cabin). There are also electrical outlets outside the cabin but none I could find inside. There was also the young guy who was in his underwear for the entire trip. He was nice enough but not very talkative. On the return, I talked with a Ukrainian ballerina all night long, which was a treat. When you get to your berth, there will be linens on the mattress. You are expected to roll out the mattress cover and make the bed with the sheets provided. There is also a small hand towel included. If you’re on the top bunk, there is a ladder that can be unfolded from the wall near the cabin entrance to allow you to get onto your top berth. Shoes can be left on the floor near the entrance. Every now and then, a stewardess (if you can call them that) will come buy offering chai (tea) or coffee. The chai is 5 UAH, and the coffee 6 UAH (they don’t tell you it costs money up front). The coffee is instant but strong and black. I enjoyed it. Down the hall near the wagon entrance, there is a hot water spicket for refills if you desire more hot water. Bring your own food and bottled water as you will be hungry and thirsty eventually. The bathroom is at the other end of the wagon. It was adequate, somewhat clean, and functional. Be sure to wear your shoes as the floor can get wet. Overall, I really enjoyed the trip. It was comfortable and pleasant. But it wasn’t fast! Be prepared to relax! I slept and slept and slept. The Ukrainian countryside rolled slowly by as Fall approached. The brown fields went on forever and the leaves fell from the trees as we rumbled by. We stopped frequently at numerous small stations. The old Soviet grain infrastructure rusted in the sun. The countryside reminded me of rural Michigan in the U.S. as it’s probably the same latitude. At one point, we stopped and then went the opposite direction. I thought I had missed Mariupol and we were headed back to Kyiv. But thankfully that was not the case as we still had an hour till the scheduled arrival time. The train was remarkably on time. I’d highly recommend the trains in Ukraine but only if you are not in a hurry. Otherwise, they are a cheap and effective way to travel.